An international bestseller, now available in this twentieth-anniversary revised edition, Rise the Euphrates reaches back to 1915, when nine-year-old Casard witnesses the massacre of her family during the Armenian genocide. Casard emigrates to America to put the unspeakable past behind her; yet as the years pass and her only daughter, Araxie, marries outside the clan, making her husband and their children odar-outsiders-the rift between mother and daughter threatens once again to tear the family apart. It falls to Seta, the novel's lyrical narrator and Casard's granddaughter, to alter her family's legacy. "The daughter assumes what is unfinished in her mother's life," Seta learns. Caught between the generations, and between the American and Armenian cultures in her Connecticut town, Seta confronts the fiercest division: the one within herself. The wisdom she gains frees the next generation in Carol Edgarian's stunningly original and groundbreaking novel. PRAISE FOR RISE THE EUPHRATES "This is a book whose generosity of spirit, intelligence, humanity and finally ambition are what literature ought to be and rarely is today - daring, heartbreaking and affirmative, giving order and sense to our random lives." -Washington Post Book World "Edgarian's sumptuous writing and uncommon wisdom about the human spirit and its maiming seep into a reader's heart, refusing to leave. This is a stunning debut, a book that will doubtless haunt its readers as it beguiles them." -The Miami Herald ..".Vivid, chilling...RISE THE EUPHRATES' richly drawn characters and the haunted voice of the narrator will long remain in readers' memories." -ROBERT STONE "How often do you get to read a book that captures you so entirely and deeply that it controls your days, measures them out and defines them by how long it will be before you can get to your next night's reading? RISE THE EUPHRATES is on of these rare treasures: a work of power, grace, beauty and exquisite tenderness. This book goes beyond the reading experience; it reminds you of your own hopes and terrors. RISE THE EUPHRATES will live for a long, long time in the manner of Wallace Stegner's "Angle of Repose" and Harper Lee's "To Kill a Mockingbird." -Rick Bass "A novel of extraordinary compassion, it's also a dead-on view of assimilation and the American experience." -Phoenix Gazette "The writing is so good it can raise the hairs on your neck." -Elizabeth Berg, Mademoiselle "To the list of well-wrought generational sagas-John Steinbeck's East of Eden, Alex Haley's Roots, and Amy Tan's The Joy Luck Club-add Carol Edgarian's] powerful first novel, RISE THE EUPHRATES." -Seattle Post-Intelligencer "Few first novels are as deeply felt, yet so clearly communicative, as this one. It touches universals while powerfully evoking the everyday world in which we cope within our families with past, present and future. . . . Edgarian's novel has literary award written on every page." 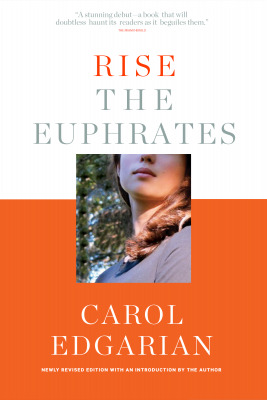 -The San Diego Union-Tribune "RISE THE EUPHRATES is an important, powerful, poignant novel. . . . Carol Edgarian's prodigious talents as a storyteller, her ability to account what there was and was not for these Armenian Americans, should not be missed." -Don Lee, Ploughshares "RISE THE EUPHRATES packs an emotional wallop." -Elle "Where is Armenia today? . . . One could almost say that Armenia persists in Carol Edgarian's prose." -New York Times Book Review "A beautiful and generous book." -Chicago Tribune "One of the summer's Best Reads " -Vogue.